Hypercom is a leader in innovation and excellence in the electronic card payment solutions industry. Their electronic payment solutions add value at the point-of-sale for consumers and merchants, and yield increased profitability for customers. Hypercom products include secure Web-enabled information and transaction terminals that work seamlessly with our networking equipment and software applications for e-commerce, smart cards and traditional payment applications. The Hypercom T7P or T7P-T, with its ability to support draft capture, debit, check and credit card processing, is the right choice for your POS product needs. The T7P and the T7P-T, equipped with either an impact printer or thermal printer respectively, are both offered at the same low price and feature the same compact design. In addition, the unique replaceable printer module in both models eliminates the reliability problem that afflicts other integrated terminals. Easy to learn and simple to use 35 Key keyboard. Under 10 second dial transaction response times. The Hypercom T7 Plus is designed for merchants requiring a compact countertop POS terminal accepting all magnetic stripe cards and delivering fast online transaction authorizations. It offers low overall cost of ownership thanks to its high reliability, communications capabilities, easy operation and advanced remote software management. The T7 Plus delivers a powerful feature set in an attractive, compact design. 35-key keyboard allows one-step initiation of all daily functions and transaction types. External PIN pad can be attached where required. New SureLoad printer with significantly faster receipts delivery allows paper rolls to simply be dropped in place without feeding through slots and rollers. Triple track reader reads driver's licenses for positive ID. T77 & T77-T The T77 and T77-T are high-performance terminals that support credit, debit, check and proprietary card processing. 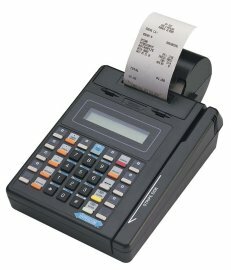 Like the T7P, the T77 model is offered with either an impact or thermal printer, both which are high-speed and easily replaceable. Easy to change paper and ribbons.